His only allies, it seems, are Mikasa and Armin as even Commander Pixis, in charge of the entire southern region, doesn’t quite seem to trust Eren even if Pixis recognizes his potential importance. The remaining forces of the new trainees are disheartened and grieving as the weight of their duty, and its consequences, truly settles onto their shoulders. Some bear it better than others. 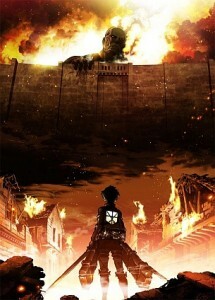 Titan continues to impress me with the sweeping consequences to both character actions and situational events – trainee reactions to their first real combat, the fallout from running out of fuel for their gear, the desperate yet determined assault on the headquarters, and the response to Eren’s startling abilities to name a few broad scenarios – but the attention to detail and time allotted to each step in the story can feel a bit drawn out. Thankfully, the means in which the story is told and the continuous engagement of the audience (evoking questions like ‘that can’t be it?’, ‘will they survive?’, ‘will it work?’, etc) counterbalances this drawn-out feeling, leaving me with a sense of thorough storytelling without toeing past the ‘get a move on already’ line. I must admit that I’m mildly disappointed in Eren’s return, but I can forgive Attack on Titan as his return has raised many more questions about the world and the backstory of the Titans than it has answered. Aside from that, this is the first time I have seen a main character return more as a plot device and less a means to placate audiences, of which I also approve.